The natural habitats of the Eclectus Parrot are the tropical rainforests of the Solomon Islands, New Guinea and Northeast Australia. Parrots are generally tree dwellers, digging a hole in the trunk for nesting. The Eclectus Parrot females range from 383-549 grams; males are 388-524 grams. Length is 12-14 1/2 inches. Lifespan is about 50 years. Males and females are totally different in color. Females are predominately red with blue or lavender-purple breast feathers. Some species have a yellow tail band and vent. The female has a jet black beak. 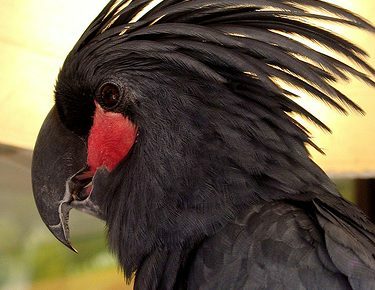 The males beak is similar in color to candy corn. Males are beautiful shades of emerald green. Depending on the subspecies, they are hued blue or yellow, some with red sides and some with blue in wings and tail. The female Eclectus has a stronger personality and is more aggressive than the male. Males are more sensitive. Both sexes make excellent pets. They are highly intelligent, playful, curious and can problem solve. They need lots of stimulation and human interaction. The Eclectus is rated among the top 3 parrots for talking and can learn to repeat sounds, words and phrases. They easily learn bird tricks. 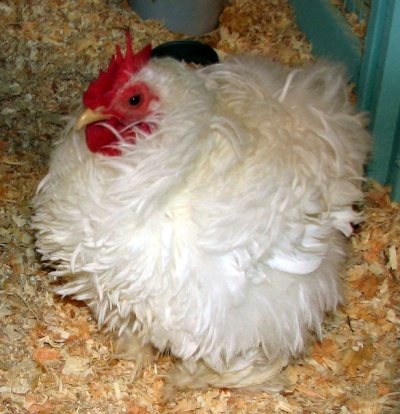 The minimum cage size is 30 inches wide, 24 inches deep and 36 inches high. But purchase the largest cage you can afford so your Eclectus has plenty of room to move around. Place the cage out of drafts and direct sunlight. If your parrot is very social, you can place the cage in a high traffic area. The Eclectus loves to spend time outside the cage and close to the family. 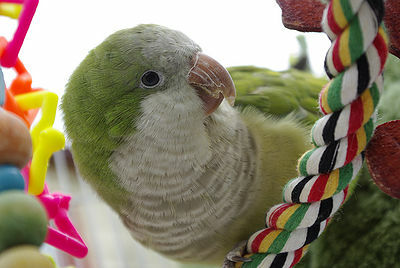 Provide lots of non-toxic toys for parrots to keep your bird entertained when not playing with you. The cage can be fitted with perches, some from non-toxic trees and swings. These parrots eat a varied diet. If possible use organically grown foods. 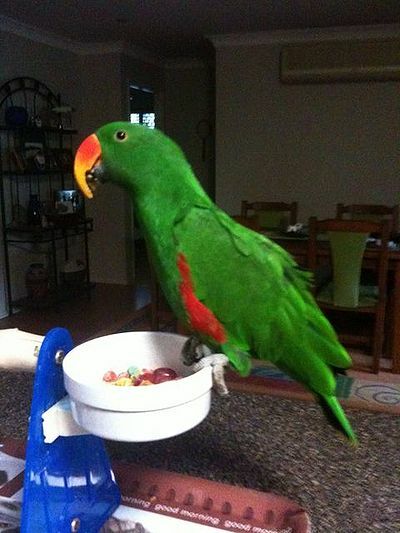 Your Eclectus will enjoy sprouted seeds, mung beans, brown rice (cooked), wheat and barley (cooked), peas, fresh corn on the cob, celery, peppers, sweet potato, broccoli, squash, beets, pomegranates, grapes, oranges, apples, bananas, mango, pears, passion fruit, watermelon, cantelope, almonds, peanuts, walnuts, cooked fish or turkey. You can also give your parrot non-colored pellets. Treats can be dog biscuits and a boiled egg. Never feed your bird pork, avocado, chocolate, anything with alcohol, salt or sugar. Never cook in teflon as it emits toxins fatal to your bird. Since Eclectus Parrots are very sensitive to chemicals try giving your bird only distilled water to avoid illness. Eclectus Parrots are usually good with other parrot species. Just introduce them slowly.